In my classroom I have been using 3D printing for just about 10 years. My district first invested in a 3D printers for our schools knowing that the impact on student learning would be instrumental in their success through college and in their futures. Today, we see a booming industry in additive manufacturing and engineers now are only beginning to see all of the potential applications for these technologies. There are many STEM based curricular programs currently being taught from Kindergarten through High School. Because of this, many schools who currently have a 3D printer at their disposal use them much like we do. Most schools use them for prototyping, small moving components, visualization of complex concepts or models, etc. However due to the limitations of PLA, the most commonly used material in school, any potential use of additive manufacturing is limited to parts that have minimal applied loading conditions. 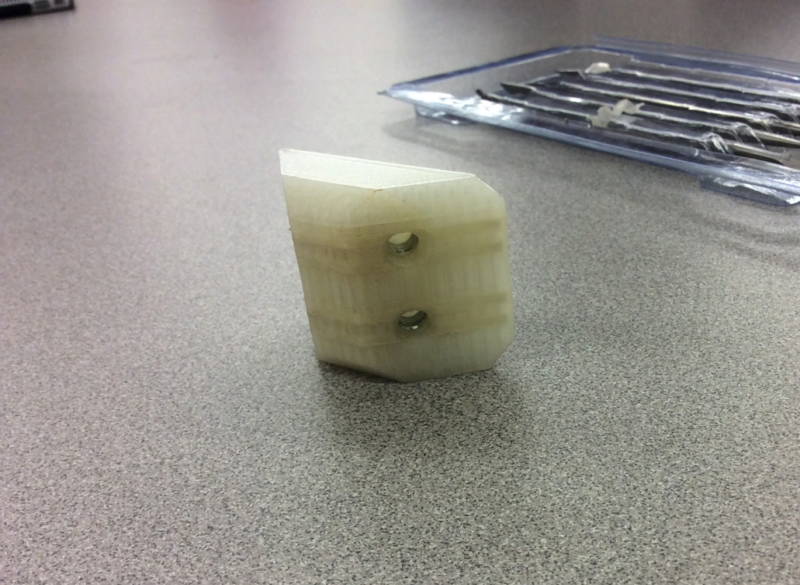 Because of this, 3D printing is not used in most functional designs that students develop. ‍A student designing a 3D printed part and working through fiber routing in Eiger. This was one of my student’s first time working with the Markforged slicer, Eiger. He was designing a mount for two 6 lb. batteries that would have to endure a significant amount of jarring while in use. The battery mount will be used in 1 of 3 combat robots the students are building. Using the Markforged 3D printer, the conversation with the student shifted from, “What is the best print orientation for time?” to, “How do I fit fiber where I need the strength?” From there the conversation led to “how do I get the rest of the part to be strong enough?” Then into a redesign of the part to allow fiber to be placed where it needed to be in all directions. The end result looked like this, the red part pictured is a PLA test print for fit before the print went to the Mark Two. ‍A fiber reinforced test part printed on the Mark Two. Typically, a student in my class would have designed this to be machined on our CNC mill, and the design would look wildly different. 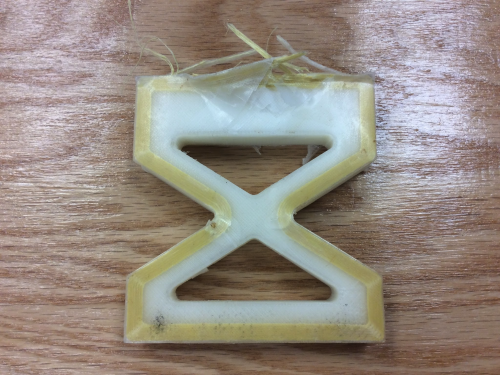 The flexibility of additive manufacturing with the Markforged printer allowed the student to iterate on design rapidly and print overnight. Otherwise, they would have spent multiple days of class time (48 minutes a day) setting up tooling and fixturing to machine the single part. 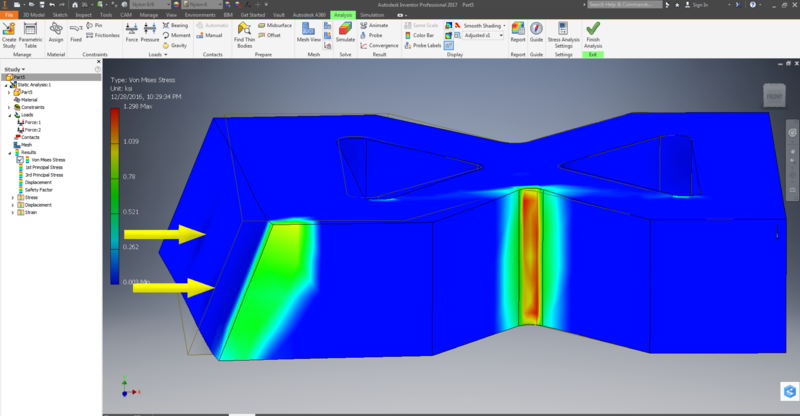 Additionally, if there were an issue with the design, the time to rework on a CNC is significantly longer. We are fortunate to have multiple CNC mills and lathes for our students to work with. In our engineering courses, the students learn basic G & M programming and CAM software. However, we have an entirely separate set of courses for teaching students advanced manufacturing at much greater depth. 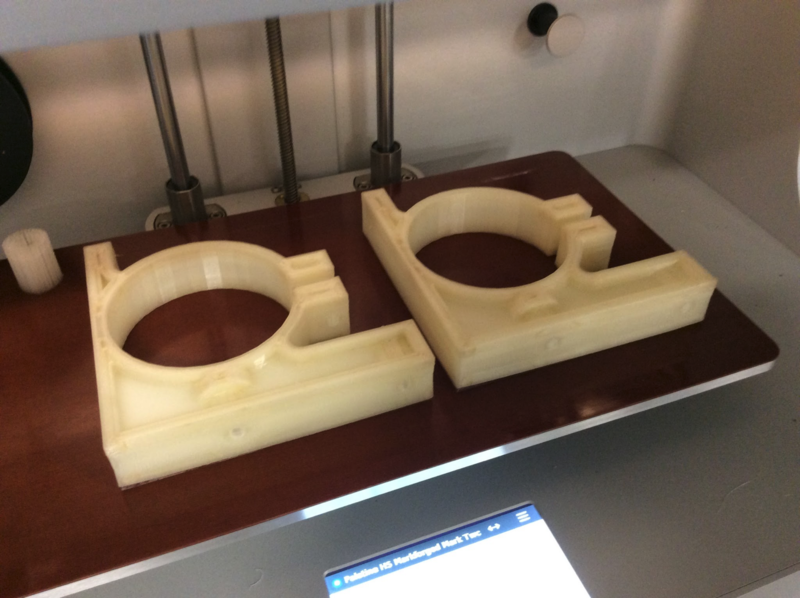 If you were to compare the time it takes to train students how to safely operate a CNC mill vs. the training to operate the Markforged printer, there simply is no comparison. In a school setting the facilities themselves can be a large challenge to overcome as well, many schools simply cannot house anything larger than a desktop CNC machine. Desktop mills have large limitations on what types of materials they can process and the cost and space requirements of a real CNC mill put the Markforged in a very unique place and opportunity for education. 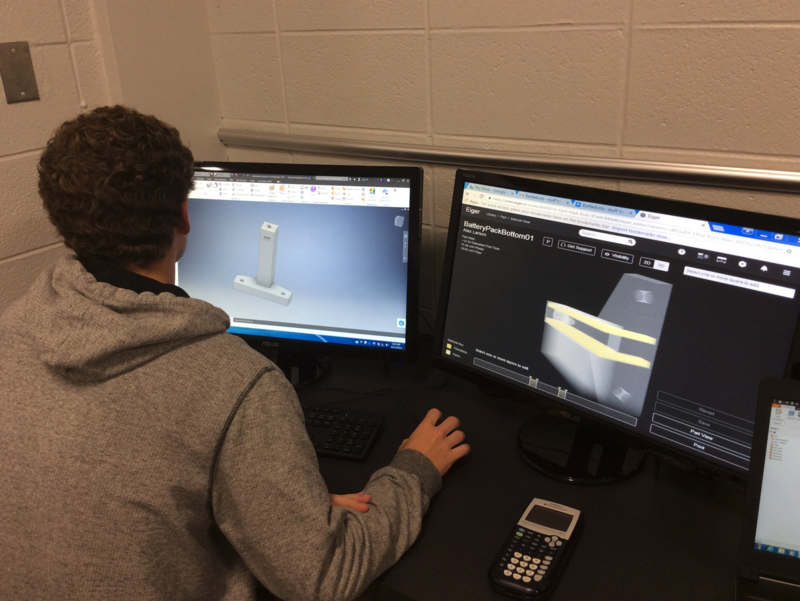 ‍Two students using Markforged to design structural components. These two students are designing a motor mount for their robot. The part has to be strong since it will be used as a structural member of the chassis and a solid mount for the motor itself. The motor must also be easily accessible in case of any issues. They attempted a similar concept printed solely out of ABS and it resulted in very quickly broken part. 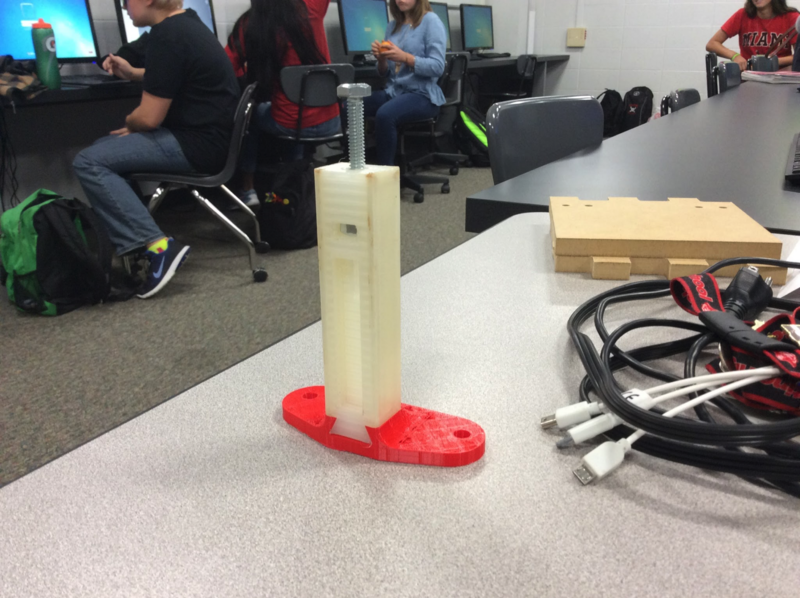 After three CAD models and one fiberglass reinforced print, the students here had to make a change in the design due to unforeseen challenges with assembly process of this motor mount. When they went to install the motor mount into the prototyped chassis, they could not install the fastener in the front of the mount. The flexibility of the Mark Two made it possible for them to print, test, and reprint the second version with a 2 day total turnaround time and result in a part that is strong enough to hold the applied forces. ‍The motor mounts finished on the Mark Two 3D printer. ‍The motor in its bracket after 3D printing. When looking into equipment for our classroom, we had to make a difficult choice, on one hand we needed more 3D printers just to handle the amount of prints students wanted to do, but on the other hand we wanted to push things further than we did in the past. As a teacher, I don’t make the technology the focus of learning, but the learning focused around the use of technology. I didn’t create any new lessons or projects that solely use the Markforged to teach students about material properties. I could have easily done that, but it happened organically. Students interest piqued when I told them the materials that it worked with. They were in disbelief upon hearing about Kevlar and Carbon Fiber. One of the first things we printed was a simple bar, just plain nylon and one with default fiberglass. I showed them the slicer and how it set up fiber and they immediately tied it to the PLTW course they took the year prior where they learned about Moment of Inertia and recognized the sandwich panel approach. ‍A test beam for the class to learn about different materials. The students then wanted to test out different material properties. 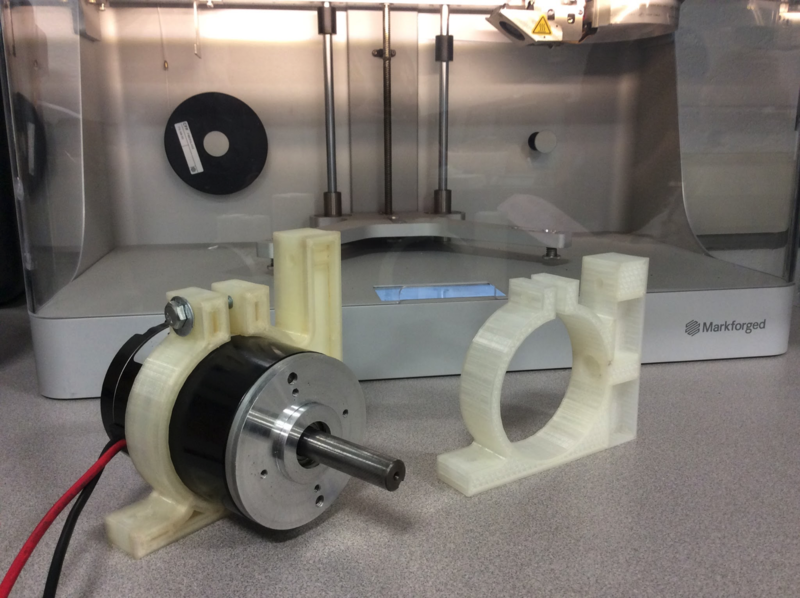 The material testing data from the Markforged website is a great tool, but for students who are learning, tying the data to a physical experience is instrumental in their understanding of these concepts. So we printed out more fiberglass and Kevlar parts. This led to some real “Scientific” testing. ‍A 3D printed brace piece to test the strength of the material and design. The above part is an impact absorbing brace for one of the robots. The students did a partial print of it to see if the concept worked in practice as they hoped it would based on FEA that they did. ‍FEA of the printed part for comparison. They ran FEA with one hundred pounds of force on the edge and face of the object and set the material as nylon, they found the highest stress in the red area. They thought it would delaminate there before anything else would happen to it. 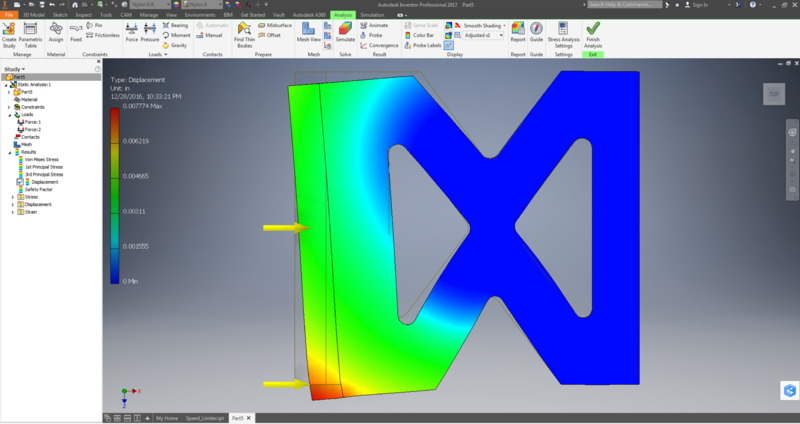 ‍Another loading condition of the part in FEA. It performed far better than they anticipated, so well that it took an insane amount of force to break the part. Eight heavy swings with a 32 oz. ball peen hammer started the failure on the edge with delamination. The force applied in the “test” ended up being about five times the amount of force they put into FEA and the part did not deflect as much as they wanted it to even with that amount of force. This lead them to a redesign. They were uncertain of how much the fiber would impact the design, and with this “test” they developed a much better understanding of the material they were working with. While many engineers do this on a daily basis, high school students seldom think of the implications of material choice for design, so getting them to think about this now is a great benefit for them in their future. 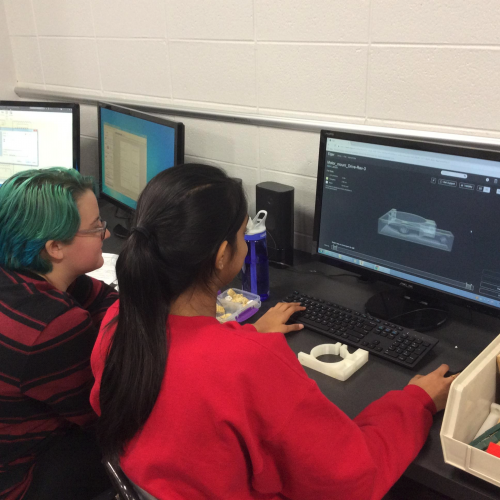 The students are not only learning about material properties through experience, but also learning how to design with additive manufacturing in mind. 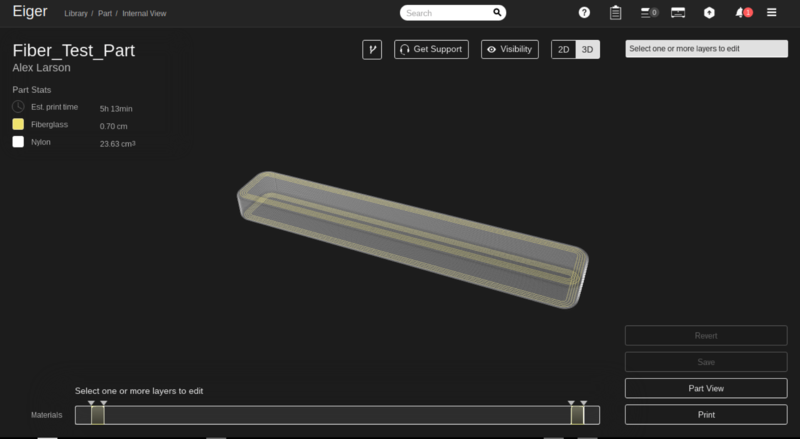 They needed to include fasteners in many of their components, so they started designing with accessible and embedded fasteners – something that they found here on the Markforged Blog. The part this student is working on was made for easy disassembly of a robot from the outside, which is why the captive nut was needed. This was the student’s first attempt at doing this in a part and in the end was a success. 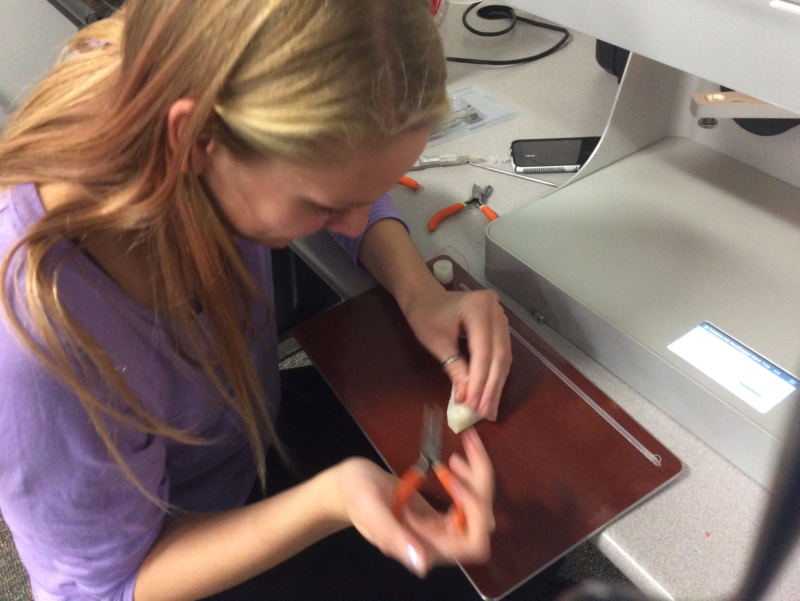 ‍A student inserting fasteners into a 3D printed part. ‍The printed part with embedded nuts, a technique Markforged has shared in the past. Education should look to influence the future. If we provide students with technologies that are able to make seemingly impossible objects, we give them the potential to influence the future with a greater impact. Not to say that CNC, injection molding, etc. are ever going to go away, but those technologies are well established and no longer hold the potential that additive manufacturing now does. The Mark Two has been a way for my students to expand their thinking in material properties and part design. As a learning experience for students it brings a whole new level of complexity to their understanding of what additive manufacturing is now and what it will be in the future.